After over 5 years I finally lost the X-Pro1 viewfinder eyepiece that has often been loose (pun intended). I have dropped it a few times in the previous years, including in the first weeks of use. Not sure when this happened but I found out when I was in Cologne, Germany in February. While this doesn’t prevent from using the camera, I think I do need to replace it. X-Pro1 viewfinder missing the eyepiece. 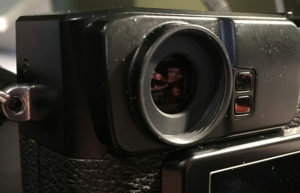 I’m trying to locate a proper Fujifilm replacement, which is part # FZ09210-100. Digging up the forum I get various stories, with a common point: contact Fujifilm. Some say “you have to send the camera in”, some say they got a replacement in the mail (no mention of cost though, but I’m not expecting it to be free since the camera is no longer covered by the warranty). Apparently a 19mm eye piece for a Nikon F3 works fine and these go for a reasonable price. I’m ok with that. On a side note, I lost the flash PC sync cover eons ago and back then it was CAD$7 + shipping for a replacement from Fujifilm. You can find replacements on ebay quite inexpensively. As I mentioned back last April, my X-Pro1 failed badly. It cost me over CAD$600 but I got it back from Fujifilm a week or so after. Kudos to Fujifilm service. At the same time they cleaned up the camera and replaced the back screen glass that had a scratch as well as some of the body. But 2016 hasn’t been very photographic for me as I haven’t really taken a lot of pictures. I used to carry my camera bag to work, and this year I didn’t. Nor did I post here. Last Saturday as I was wandering around in a park in Laval, QC (northern suburb of Montréal) my X-Pro1 decided to stop working, shutter stuck closed — the camera turn on but doesn’t respond to anything ; it will respond to the firmware flash mode triggered by [DISP] + power on. A quick search lead to other people with the same problem and with a a claim of a $500~$800 (USD?) servicing cost. When a X-Pro2 cost CAD$2000, it might be a no-brainer. The camera is now in the shop, in the hands of Fujifilm Canada technicians, and I should know soon. In the mean time, back to shooting with the Canon 5DMkII. It is even more sad that my 2005 Canon 20D still work. Zack Arias take on the Fuji X-T1: Yep. It’s A Fuji. Conclusion… I have zero regrets about selling all of my Canon gear and going Fuji. Zero regrets. I have to admit, I’m not a pro like him, ie I don’t shoot for a living (also I’m less talented), but since I have my X-Pro1 I haven’t used the Canon much nor even lusted on any piece of gear for it. Last week I have had my hands shortly on the X-T1 and the EVF is absolutely so much better than the X-Pro1. Non-withstanding the other advantages. If only I could try it longer. This lens will provide a fast 35mm-like lens ; one of the favourite field of view of street photographers. 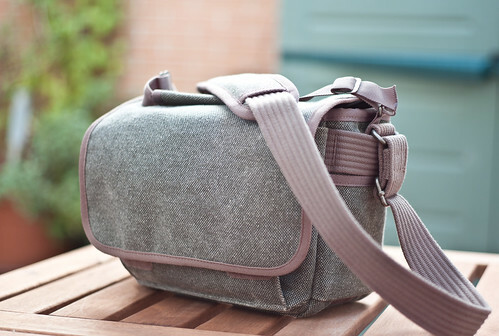 The Best Street (Casual) Photography Bag for the Ricoh GR and Companion. 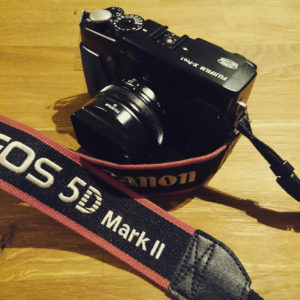 I’ve tried quite a few bags, too many to name, but let me tell that the Thinktank Photo Retrospective 5 has stolen my heart and the hearts of my two primary photographic tools ― the Ricoh GR and the Pentax K5 IIs. Its like this: you know how you fall in love with a certain comforter and that’s what you like to sleep in all time. Well, its like that for the GR/K5IIs and the Retrospective 5. I can’t think of any other bag that has all the features that one needs to have while on the field photographing. While I don’t have a Ricoh GR, I bought this bag over a year ago to use with my Fujifilm X-Pro1 – after having bought the Retrospective 30 – and I love it. It even fits the 5DMkII with the 24-105 or the 40mm pancake. They added an audio input jack – which the X-Pro1 didn’t have, sadly. While this doesn’t matter for the still photographer, the videographers will really appreciate. And hybrid still / movie cameras are the future. And I have that pet peeve about Youtube videos with awful sound. Fujifilm just announced the X-E1. Simply put, it is a cheaper version of the X-Pro1, without the optical-hybrid viewfinder, slightly shrunk down, albeit with a very similar design. In addition it has a popup flash next to the EVF. Engadget has a preview of the X-E1. The camera body only will be around $1000. Comes in silver or black. As previously announced in the XF lens roadmap, the 18-55mm f/2.8-4 OIS zoom for the X- series will be available at the same time in November, standalone for $900 or as a kit with the X-E1 for $1400. The 14mm f/2.8 will also be available in November for $700. The speed improvements in the X-E1 seems to have been rolled into the firmware 2.0 update that will be released September 18 for the X-Pro1 ; DPReview had the privilege to get their hands on the update. While the X-E1 isn’t really for me, as I own a X-Pro1, it is very nice to see that Fujifilm seems to be committed to the system and release more than just one camera. By lowering the price point of the body, and catering to zoom users, they really want to expand their market. And this is good news.